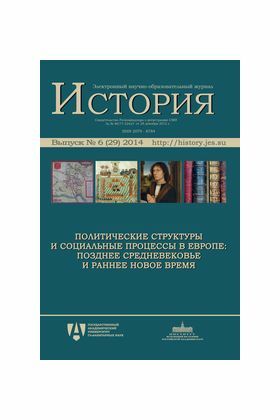 This thematic issue consists of the materials of the conferences that took place at The Institute of World History, the RAS, and were in honour of centenaries of two leading Soviet medievalists: “Scientific Conference in memory of E. V. Gutnova (1914—1992)” (Moscow, 14—15 April, 2014) and “Modernizing processes in Old Europe: structures, collisions, people (To the centenary of the birthday of A. N. Chistozvonov)” (Moscow, 9—10 June, 2014). The published materials allow us to trace the evolution of main themes that were developed in the Soviet historiography and, as it turns out, continue to be a matter of interest nowadays. As was expected, subjects that came under notice only during the last years of the Soviet medieval studies got a new impulse in the historical studies of the 21st century. For example, section “Political structure of the monarchies of Old Europe” includes articles on the history of political culture, functioning of representative institutions, problems of citizenship, some aspects of diplomatic history. If Reformation was researched in the context of socio-political struggle during the Soviet time, now it is characteristic to express interest towards internal / inner religiosity (“Piety and Society”), although political aspects of Reformation still attract the attention of the researches (“Reforms and Politics”). Contrary to pessimistic view of the national historiography, there is still interest towards such classical themes as genesis of capitalism, economic history, history of peasantry, and history of medieval town. Traditional approaches coexist with new research methods (“Town, peasantry, and genesis of capitalism”). As anticipated, there are articles concerning the present-day assessment of the works of E. V. Gutnova and A. N. Chistozvonov (“Tigers of medieval studies”) and also those on the present state of the researchers’ archives and memoirs (“Source study of historiography”). Doubtless, the readers will be interested in the subsection “Comprehension of revolution”, where there are different points of view on the events of the later 16th century that led to the formation of the Republic of the United Provinces. These viewpoints are typical for the Russian historiography and for the school education in the Netherlands. Uvarov P. Yu. Soviet Medieval Studies Today: a Lost Legacy, or Continuation of the Tradition? Ivonin Yu. E. The Diet of Spires, 1544: the Way to the Augsburg Religious Peace of 1555? Soviet Medieval Studies Today: a Lost Legacy, or Continuation of the Tradition? The Diet of Spires, 1544: the Way to the Augsburg Religious Peace of 1555?